I guess the 'big' story yesterday was the generosity and statesmanship of our PM. Time will tell where this money comes from, where it goes to, whether it is used wisely and well, and what % gets redirected in the name of green if not for it. And folk wonder why the public are cranking eyebrows. There is what we know, there is what we don't, and there is what we are told. Seldom is this done without a narrative being enhanced or an event being interpreted. Which becomes pertinent, and key, when it comes to what we are told*, especially about vast amounts of money to be dedicated to 'solving' things, which seem a bit shy on detail as to what, specifically, and how measured to assess enviROI, etc. Numbers do matter, even as science gets settled (if often in creative ways), and passed on by those we pay, and trust to be our guides. But I am glad I persevered, as there was much to ponder of value, and I appreciated the maths lesson. Makes me wonder why such calculations are often beyond those who claim (all dutifully passed on by those copy-typing press releases as 'reporting') that 'such and such 'could' power 1/2 of 'so and so' for 'free' (exc: construction, operation, maintenance, repair and disposal). You forgot to mention that those big wind turbines are also erratic, so you need a big back-up source of power to manage the lows. One just has to hope that, when given the massive importance of the basic intent to reduce GHGs, and the vast monies involved in securing that laudable aim, those with the power to take and dispense the funds in securing this, plus those tasked to hold them to account, know what the heck they are doing. And are guided by honest, unselfish influences and not the lures of personal advancement, ratings, career influence, lobby-influence, bonuses, targets and box ticks. *Clarified, often, only after the the hyperlink and/or in the small print. As you'll gather, I appreciate a done deal when I see one; I just express the hope that it will be upfront and accurate. And.. reported with competence and objectivity. I have this slight concern the media are every bit as much a part of the problem of public understanding and engagement. climatebiz - What's Keeping Climate Investment Out of Africa? http://bit.ly/6EjAcV - maybe that money in Africa often doesn't end up where intended? UN - UN online tool allows people to track nations’ pledges on climate change http://bit.ly/6xLQpu - as to delivery...? JaymiHeimbuch - RT @planetenvy Rainforest Nations: We'll Drop Deforestation Targets if Rich Don't Put Money on the Table: http://digg.com/d31Ca8A - Blazing Saddles anyone? timesonline - Gordon Brown and Nicolas Sarkozy: banks should pay for climate change http://bit.ly/5YiQS2 - No reward for failure! Thank heavens I have very little in the bank. Mainly due to Mr. Brown p*ssing money away on things that don't work. guardianeco - EU set to double climate aid for developing countries to €2bn http://bit.ly/8L8ULR - Game, set and fudge? jimpenny - http://twitpic.com/t5fnq - I save and reuse my false eyelashes, I care about the planet! (via @theboygeorge) - every little bit helps? I am presuming irony at play. guardianeco - A £480 train ticket to Copenhagen makes it hard to care about the climate | George Monbiot http://bit.ly/71rfgg - No, it makes it harder to trust and/or believe in hypocrites who say one thing and do another. It's different. And rubbish pricing on more eco transport options is not mutually exclusive with caring that the bozos making decisions seem to be 'selective at best'. futerra - Ed Milliband on C4 using #sizzle message "we need a positive vision, let's sell dreams not nightmares". futerra.co.uk/blog/611 - Now, where did he end up at that notion? Guess we won't be seeing the ASA-referred, inaccurate, scaremongering ActOnCo2 bedtime story ad again, then? journalismnews - PDA: ‘Algorithms will replace journalists’ http://is.gd/5jqNo - speaking of our mighty 4th estate... Well, it can often seem that much reporting these days is mainly cut and pasting of press releases with little checking or critical oversight. Greengamma - 'Dirty' battery cars 'make more CO2 than they save' http://bit.ly/5R7T4P - see the issues, gov...media? And that's just the retweets in a day. I really can't be bothered to go through all the others I favourited, as they are usually the contentious ones, and really, life is too short. TWEET 'N LOWDOWN - S****page! It's not what you think, but merely a media trick to get more folk reading... did it work? I wasn't expletive deleting, but in writing that was reminded that it would be on the website, which has a rather over-enthusiastic 'swear filter' that takes out anything it think innocent eyes should be spared. Anyway from yesterday's twitter surf RT/save collection, the dominant story that caught my eve had to be the boiler scrappage initiative introduced in Alistair Darling's pre-budget wassname. About the only good thing there, as it's hard to find much else when 'we' owe' billions, if not more already. But this one makes sense. Subsidy money is being given away left, right and centre, and this seems to be a rare 'win-win', with it going to reductions and efficiency increase, and hence lowered GHGs and reduced expenditure for those who can ill-afford it. I just hope this government actually has the money to do it. guardianeco - Boiler scrappage plan aims to help 125,000 householders http://bit.ly/86hFfZ - AIMS? solarguy2034 - In Copenhagen, Stores Heat the Streets: To encourage Christmas shoppers, many stores in Copenhagen leave their .. http://bit.ly/6J8EeK as Junkk.com has noted, and suggested a response, more than once before. Actually, more like a teetering tower... that of Babel. This is my first 'round up' of yesterday's retweets. Not sure it will work. There were so many. Which at least serves for the point of this post. I was once appalled to be in the midst of a council meeting where there were about twenty folk shouting the odds. Whatever the intention it was a total waste of time, effort and resources as nothing got agreed, or done. I, and a few others there voluntarily did note that most 'officials' there were all on salary, plus expenses, whatever happened. I can only imagine what it must be like with tens of thousands, all shouting, such that not only no one can hear each other, they but won't even bother listening. All paid, or paid for. As are all those there to 'report' on it. Like they really care. The planet, meanwhile, goes on, if perhaps with a tear in its eye. Right we're on air. Do climate deniers deserve to be part of this discussion? - Nice of the BBC to ask, but who are 'they', and who are 'they' asking? Ed Miliband? Voltaire (possibly) rotates in his grave. RT @thomsmith: How can we take climate change seriously when Richard "@virgindotcom" Branson is talking about space tourism? - More crucially, when some irony deficient MSM outfits run 'sombre' climate stories and then happily send their teams off to the mojave to film rockets that don't get airborne without some stuff out the exhaust. And one more* that has now dropped off the archive, which rather makes me feel that RT'ing is a pretty short term, useless facility if you want to keep an archive record. So I think I'll give up on this before I end up a messy creek sans paddle. Twitter is good for getting stuff in and as it happens. No more. But mainly I think I'll just favourite the stories linked to on my browser so I don't lose them, and use the browsing history to blog from in future. Sorry, twitter, it's just not going to work out as I'd hoped. At least like this. *http://twitpic.com/snodu - In addition to the message being rather overshadowed by less than green messageboard materials, I do rather wonder what the awareness that is being raised here actually is. Know that 'incentive' mantra I keep chanting? Took a loooong while as I had upload issues and the system couldn't cope with my 'suite'* idea, but the organisers were very helpful. Doubt they'll be in with much of a chance now as the competition closes soon, but at least they are now in. *One to freak out the health and safety guys, but here goes. It has always frustrated me that many public recycling facilities involve a dirty great (heavy) steel container that requires a big-engined, high-powered truck to haul away often only a few kilos of 95% fresh air surrounding a veneer of card, glass or metal. They are also often smelly, and boring. And no one crushes waste bottles, cans, etc because they are already confused by a plethora of do’s and don’ts regarding what’s cool and/or not. But one thing is clear: we need to get stuff as small in volume as possible to make the most of the logistics’ systems carbon footprint. This also tends to help with recycling anyway. Then we need to make it so people a) want to do it so they try, and try again, and b) enjoy it so much they do it again and tell their mates. So… pretty much fun, then. We need venues. And where better than supermarket foyers or shopping centres, which would confer green kudos to savvy CSR marketers who can sweeten the extra traffic likely to be attracted by offering reward opportunities to those bring in the correct materials? Possibly consumers get to hand in waste in exchange for Junkk bonds to use on… eco purchases. RE:Gymberation posits a ‘zone’, where by human energy is harnessed in the cause of greater fitness and… reducing recyclate volumes for transport. All the shredding, smashing and/or flattening is done by one human power on a series of exercise devices that serve to not only dispose of waster materials, but in an entertaining manner. Some could indeed be prone to misuse or vandalism – so possible solutions are sensors to divert metals or, more practically, human oversight, hence being located near staff, which also supports reward redemption. A few complementary freestanding systems are suggested, specific to particular recyclates. Based, almost identically, on either a fairground mallet and bell concept, or the ‘Whack-a-Mole’. 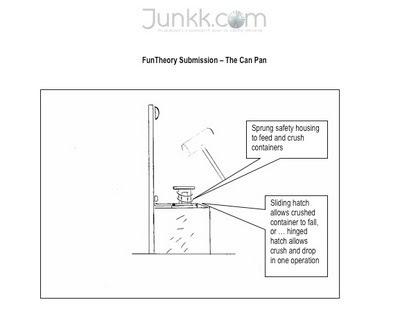 The can or carton is introduced to be crushed by a wide head mallet, with the flattened result dropped into the receptacle below. How spooky is that? Annoyingly, it's a top 10 idea. He who hesitates - or has a less than compatible browser... is lost. Just had a nice call. Remember my Voucher Tree idea? Well, one of the schools we helped has just advised me that they had enough coupons in their coconut to be redeemed for a new wheelbarrow for their organic garden. Every little bit helps, eh? But I still can't stop wondering how much better it would have been, for all in the community, if Morrison's had allowed us to put the tree in their foyer to catch folk as they were leaving. It would have reminded those without kids to collect them anyway, the schools would have got tons more... and the store itself would have gained awesome PR. The problem with online experiments is that the positives can be matched equally by the negatives. So for all the advantages of speed, ease of creation, etc, there is that slight worry that the minute you hit 'send', it's out there, for all to see, with its flies open. Following some truly appreciated support, I am beta-testing (ok, trying out) a new twitter regime. Basically, I am going to use the new twitter retweet button to scoot throught what comes my way, morning, noon and night. And as the system permits no comments, I can't and hence won't. So if the content delights... or enrages... with luck the twitocrats will realise that to get context they need to follow the trail, to bouquet or brickbat the authors accordingly for their <140 masterpieces. Meanwhile, the plan is for me to go back over the day (if I have time... most likely next morning) and do a quick review of those that tickled my fancy. The issue.. as some would have it? Just heard on the BBC as the talking head reads out what he's told to ask Prof. Sir David King: 'the issue is that a large number of people are saying there is nothing to be concerned about'. Or is this how the government and its media shills would wish to see 'the debate' framed? Anyone who thinks there are no issues of concern regarding PMWNCC is a) not being too rational and b) in a very small minority. Hence why play that up? My concern, and I suspect that of others, is that 'climate' gets used as an excuse by already mediocre minds to try and compensate for fiscal failures elsewhere that will have zero or, worse, negative enviROI impacts on my kids' futures. I smell straw men, and the media using them to frame...more like steer the issues stinks. At least the talking head raised the contradictory point of Ed. Miliband shrieking about reductions whilst the government he is part of is advocating a 3-fold increase in air travel. But this is an MSM that seems to see the US EPA and its timely actions as somehow unconnected with media management in a new era of command and control by big government. And is one that also doesn't 'do' irony. At least, watching today's broadcast news as I now catch up on the print. Dancing to the tune of PROs of your mates and issuing news by press release does the BBC (or any medium) little credit. Especially when it is contradictory. You either think greenhouse gasses are a here and now issue, or you don't. Stick Ed Miliband and Richard Branson up together on this and I think most environmental correspondents' brains would freeze as anything either comes out with gets shared with zero critical thinking attached by our star-truck, government-slavish media. Some entirely welcome, and valid coverage on Copenhagen, and the issues at stake. Then a few more pieces, followed by a commercial for favoured son Richard Branson and his next moneymaking scheme taking the uber-rich into space for a quick Kodak moment. But it's all ok it seems, as the design of the craft is, according to the [at least in the case of the BBC, astoundingly] reporter, 'fuel efficient'. Dancing to the tune of PROs of your mates and issuing news by press release does the BBC little credit. Especially when it is contradictory. Stick Ed Miliband and Richard Branson up together on this and I think your brains would freeze as anything either comes out with gets shared with zero critical thinking attached. To be fair (if conceding two wrongs makes an MSM consenus) SKY had the same double standards as well. Who gives a sod about the planet if you get invited [to the Mojave Desert] by a ratings-cert Celeb billionaire to play with his rocket? News generation by PRO and reporting by press release. Unique. 'The environmental impact would be minimal, Branson said. "It's almost zero carbon output. We can put people into space for less carbon output than say, a flight from New York to L.A. and back, and that's for your particular seat on the flight from New York to L.A. and back," he said. "And I think in time, we will almost definitely be able to get to zero carbon output." That is almost definitely a meaningless crock of... unsettling science. Apt as the various debates around reducing GHG's swirl like contrails from a plane taking off from one of Gordon Brown and his government colleagues' (esp. Miliband. E) expanded airports. But saying that would seem to make me a denier, or maybe saboteur? Too the too-cosy double-standard world some in the politico-media bubble live in, perhaps. Welcome to a Britain where the media is managed, and barely managing professionally it seems, other than via 'news' from press release by government or corporate PRO. And amongst a few nice things (my wife has been active on FaceBook and reconnected with some old friends who it was lovely to hear from) there was one, truly horrible one. Which, though it affected me badly, and still is a matter of upset, might have been the best thing that could have happened in a long time. It was a truly awful, personal 'tweet' on my twitter page. This person had got a very wrong end of a stick, and instead of thinking for a few seconds had sought offence which, as I am oft prone to quote, if you are looking for in any way, it will happily present itself easily whenever required. I was shocked by the passion and the bile. All in 140 characters or less. And all because we are in a time poor world where people react rather than think, and cheap talk has more value than considered actions. Well, and here's the 'good' bit, after 24hrs pondering, I have decided enough's enough. I enjoy debate. I think I am good at it. And I do think what I say can have value. But talk can also be very cheap. And pointless. I have valued Twitter for the information it has brought my way, but 9 times out of 10 it has been in a form that is hard to trust and hence needs a lot of checking. But not just Twitter. At the other end of the communication spectrum, even the so-called 'MSM' (main stream media) is now so corrupted by agenda, dubious affiliations and the seduction of career-driving ratings in an already facile 24/7 'news' environment, nearly all 'reporting' now is commentary, and all commentary is only as good as the person passing it. And that, these days, is near zero. I have seen Copenhagen as an iconic event, much as many other sincere, idealistic folk. But now it has arrived I think it will just be another jamboree of tribalism and hypocrites jockeying for personal gain, be it monetary, career or ego-boosting legacy coverage. Maybe there will be 'a deal', and maybe it will involve some positive aspects. If so, great. But I cannot see the juggernaut that is the various competing global lobbying groups being influenced one jot by what I might think, say or even if the latter resonates with the few I share my views with. So all the Twittering, blog-surfing and contributing has to stop. It was, is, and I suspect will be mere exercises in futility. To make a difference I have to get back to doing, even if it is just in the smallest of ways. Because a deed that is appreciated and inspires can lead on to more, bigger and maybe even better ones. So to that very sad, angry person: thank you. But I am not above hoping that by your words I will be returned to actions that will one day come back to haunt you and what you stand for. Words to live by. And act upon.